Infravision Enter the Unknown 21 Chiss have adapted to be able to see in both the infared and normal visual-spectra. This enables chiss characters to remove up to one Setback die added to check by lighting conditions. Tinkerer +1 Hard Point to single object. 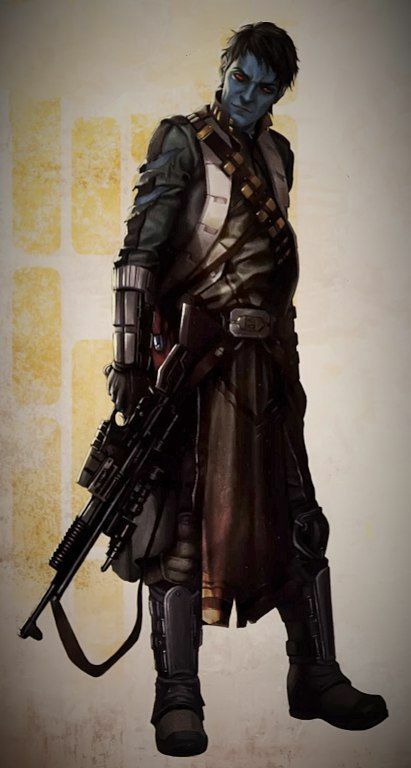 While apart of the Chiss Ascendancy, Viktiel was in a fighter following some pirates attacking a military shipment. They punched to lightspeed, and Viktiel (against orders) decided to follow. The coordinates were off, and he was in hyperspace for much too long. Found adrift by hunters, he has been able to survive for the last few years. His skills and experience, along with his initial encounters with scavengers, led him to start working in Hutt space. He prefers to work with reasonable people who don't attempt to constantly control him, but hasn't had much luck with the power of the Hutts and Empire always overbearing on him. He has been licensed with an Imperial Peace-Keeping Certificate. He is foremost an active dues paid member of the Bounty Hunter's Guild, House Neuvalis. His mentor took him into the guild about a year into the life after his mishap, and was the one that gifted him with the Shadowclaw. His mentor died recently, from unknown circumstances involving a hunt for the Black Sun. He seeks to eventually hunt down his killers, as long as his guild allows it. Viktiel's current standing with his guild and house is somewhat up in the air. After the death of his mentor, he must truely prove himself worthy. Hoping to hear from them soon on an official bounty. Viktiel wants titles, commendation, accolades, and power. He strives to better himself, collect what he can, and grasps for as much control in his situation as possible. He has struggled all his life for some semblance of freedom and control, and has yet to gather anything resembling that in his eyes. Viktiel has borrowed and possibly accrued extra debt from various jobs or gambling. This is owed to the Hutts. One specific instance of this is due to failing a job. Vik thinks this job was a set up, but hasn't been able to prove it. This likely would have gotten him killed, but his strict adherence to the Bounty Hunter's Creed allowed for the guild to step in on his behalf. Wearing dark blue and black comfortable yet tight spacer clothing. No weapons in obvious sight, and his red eyes are always scanning his surroundings. 2- it’s definitely not pirates (Helios station)- fixed comms and reactor on Helios station, battled old battle droids. 500 credits, 500 in plasteel, 15 XP. 3- Crafting! 11 fist weapons, 30 craft hours, 2 schematics made for Fist Weapon, bought toolkit. -470 credits. 5- Hunt for Alasc - 500 credits, 20 xp, looted rocket boots, surveillance tagger, stun cuffs, fusion lantern. 10- Bounty on Dooma and Jarred, 15 XP, 3000 Credits, lost eyes; got new ones?